Blue-Eyed Girl Lacquer isn't new to me. 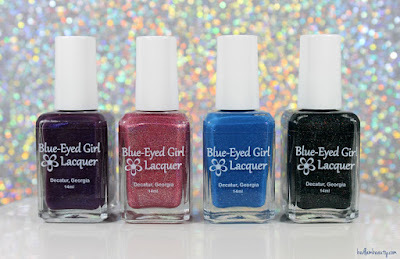 I have a couple of bottles and they are among my favorite laid-back holo shades. For some strange reason, I never even considered that she could come out with something vivid and striking. Are we all in agreement that I am a fool? A foolish, foolish fool. If you aren't yet, you will be. Check out these amazing shades that are coming in the "Innocence in the Moment" collection. 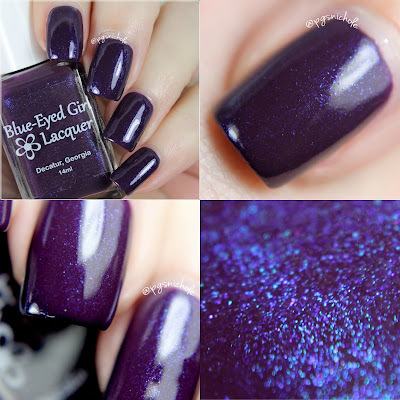 This deep, smokey amethyst filled with vivid blue and pink shimmer. At first I thought this was going to be a three coater because normally polishes with this sort of subtle shimmers tend to be on the jelly side...but this one wasn't! 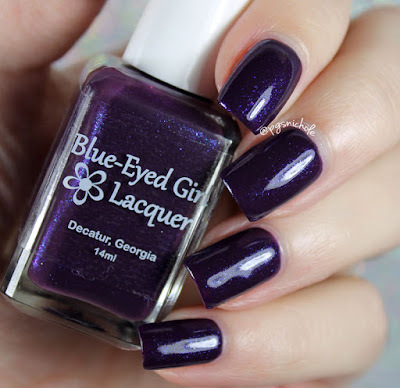 Somehow it was opaque for me in two coats and the shimmers are still readily visible at practically any angle! 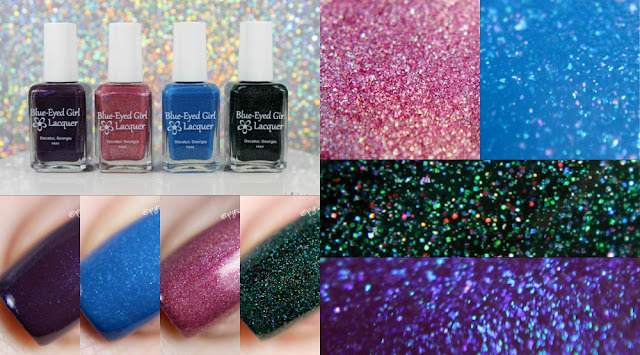 This shade is a bright, electric blue filled with a rainbow of iridescent small flakes. 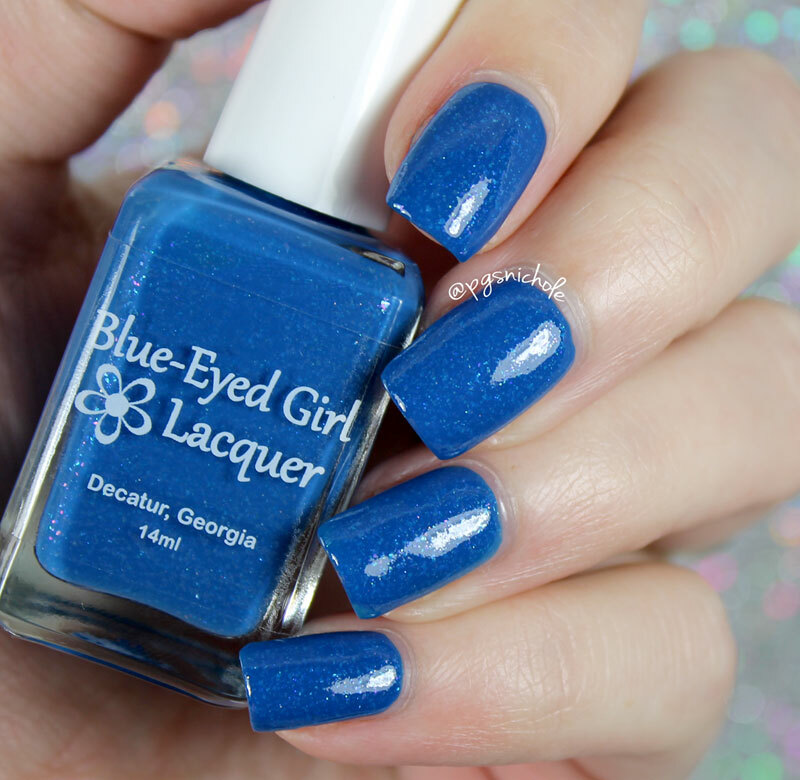 This blue is almost perfectly Whovian, and it a great option for those of us looking for something slightly different. I used just two normal coats here, and it was wonderful. This shade made my fingers wigglewaggle in anticipation. Normally I would not call myself a green fan, but recently I have been finding that it wasn't green that I didn't like...it was boring green that I didn't like. This is anything but. 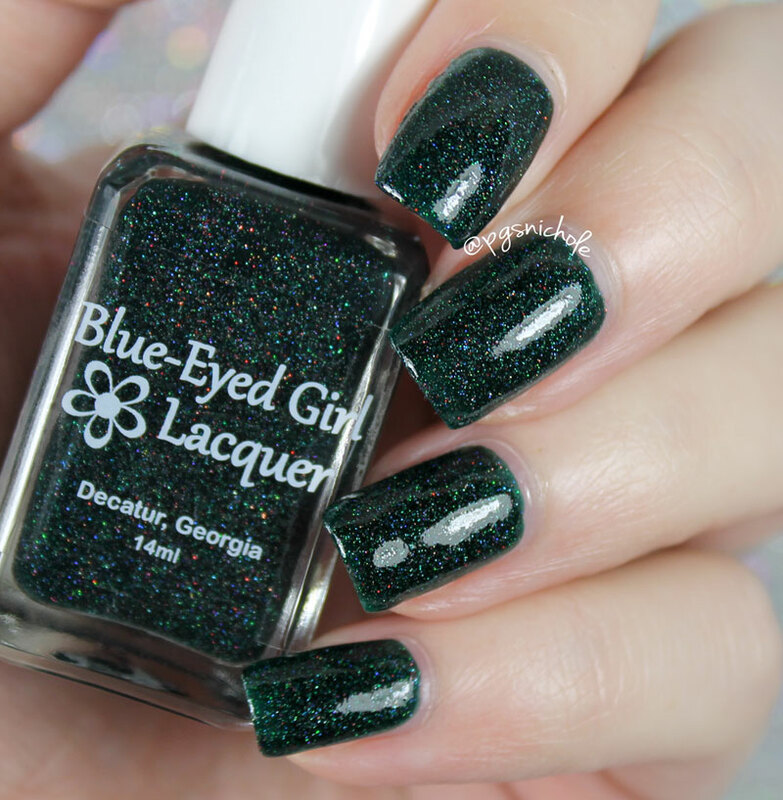 This deep forest green jelly is drowning in micro holographic glitters. I only needed two coats for this one too. I can't tell you how much I enjoy saying that. 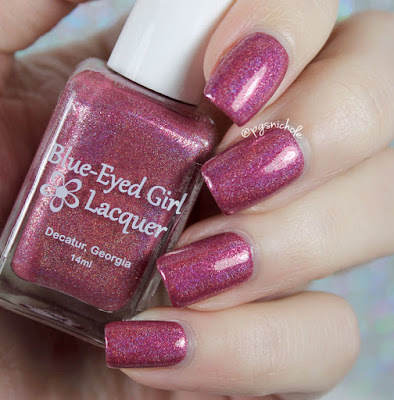 Last, but definitely not least, is this pretty berry-rose holo. It reminds me a lot of a strawberry smoothie...if you could fill smoothies with holo and platinum microflakes. Which, while beautiful, does not make for good eats. This shade applied easily and smoothly and was totally opaque in two thin coats. This collection is definitely right up my alley. It has a color for whatever mood I'm in, and that is such a nice thing to have, This collection will be available via pre-order in the BeG shop January 27-29th. Which one is your favorite? I Only Meant to Stay a While is stunning and easily my favorite, I am a sucker for green! greens look so good on you! Well, these are gorgeous. I'm not even going to try to choose one! Ohhhhh "I Only Meant to Stay A While" is a heart-stopping green. It makes me happy sigh. Ohhhh. Wow...I Only Meant To Stay Awhile is gorgeous! Oh wowwwww... That shimmer in Basking in the Storm is gorgeous! I love I Only Meant to Stay a While, too! they are both so lovely. Basking in the Storm and I Only Meant to Stay A While caught my eye, they are so dark and lovely! Chasing the Skyline has my name all over it. I need Basking in the Storm! I love this collection so hard! Gah, this is a really lovely collection! Chasing the Skyline and I Only Meant to Stay A While are my favorites! This is such a beautiful collection with a little something for everyone!